What a concert this must have been! 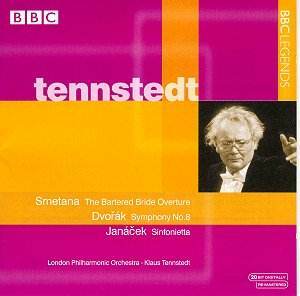 Tennstedt was one of the jewels in London’s crown during his tenure at the LPO. I well remember a stunning Mahler 6 – with no other works in the concert – at the Festival Hall. On that occasion I sat in the choir stalls, so I was directly facing Tennstedt and able to see his every facial expression, his every baton movement (not to mention my getting intimate with the fourth horn part!). He gave his all when he conducted, using his whole body to get the results he wanted. And how the LPO played for him on that occasion … and how well they play here also, in a programme of well-loved Czech music. The Smetana Bartered Bride Overture is given a punchy, jubilant reading. There is a tangible aura of the theatre about it – except that the strings articulate the difficult passage-work better than most pit orchestras would; and the piping, Czech-rustic woodwind from 5’14 are a delight. Not often one hears cheers after an overture, especially in London, but here they are – and richly deserved. The warmth of the opening cello and horn melody of Dvorák’s Eighth Symphony is emphasised by the proximity of the concluding Smetana high-jinks. It is difficult to imagine this long line more lovingly phrased – it is positively pliant, yet contains enough energy to enable us to set sail on this symphonic voyage. The recording is detailed if not overly-spacious. Of course live performance enables the conductor to take risks – so at 4’32 Tennstedt decides to really languish on the harmonies preceding the return of the first theme. There is, however, an unaccountable sag in the tension around the eight-minute mark that should be noted (Tennstedt brings it back on track a few seconds later – the harmonic arrival at 8’13 is resplendent). There is something almost Wagnerian about Tennstedt’s reading of the Adagio, coupled with a recognition of the Bohemian aptitude for tone-painting. This movement explores richly varied emotional terrain, including real drama leading to a tangible sense of elation at 5’16. The jubilant explosion is nevertheless carefully balanced by Tennstedt - the bass scales are clearly articulated. An Allegretto grazioso with a sharp rhythmic profile, and even some tasteful portamenti, leads to a carefully considered finale. The opening trumpet call resounds with confidence; the horn-whoops work as an effect yet are not so over-the-top as to be elephant impressions (the danger here). The ending has tremendous force - the aural equivalent to moving into overdrive. Tennstedt himself seemed to buzz with energy when he stepped onto the podium, so it is no surprise that there is no glossing over of Janácek’s more schizoid side in this blazing account of the Sinfonietta. Try the manic second movement for this, a dark invocation of barely-controlled panic. Juxtapositions are stark and all praise should go to the violins, who play their stratospheric passages better than many studio accounts manage. The third movement is superb. Not as overtly Romantic as Belohlávek in a live performance with the Philharmonia recently in the same venue (review), Tennstedt instead sees these gestures as just one of many at Janácek’s disposal that are juxtaposed in this movement. A pity the horn whoops are lost in the balance (around 4’00 – 4’10). The outer movements show off the LPO’s superb brass and timpani players. In the first, remarkably smooth upper brass slurs contrast with the punchier lower brass and timpani. The finale builds inexorably from the most delicate evocation possible from woodwind to a massively uplifting brass and timpani-dominated conclusion.